It is an established fact that most of the students remain deprived of success not because of lack of knowledge, hard work or intelligence but because of lack of guidance, planned approach and poor study techniques. Success is not just dependent on ability and hard work but also on effective methods of study. 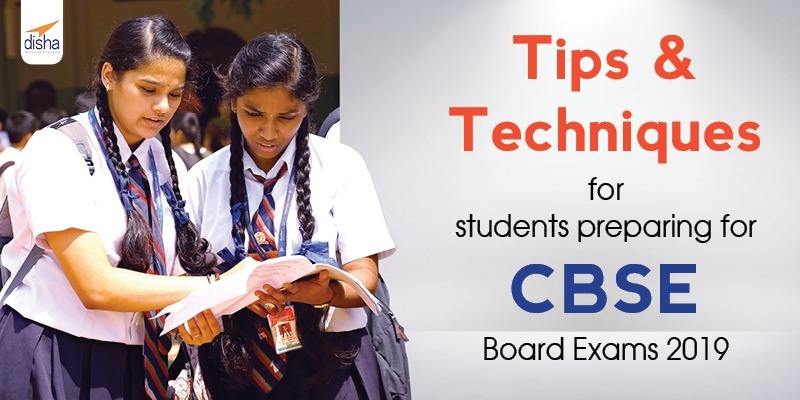 So, here we recapitulate the basic techniques and tips for CBSE board exams 2019 that positively help students convert their potential into performance. It is advisable for students to handle time with great sensitivity. It is said that time is money. You need to make the best out of it before it is too late. So, start early. Organize yourself. Plan out and schedule your study. Here is an outline of timetable to ensure that you utilize time in the most productive manner. You can modify the time table to suit your requirement and convenience. Stay abreast of the class lectures. Revise previous day’s class work before the teacher starts the class. Revise present day’s class work when the teacher finishes the class. Organize your study space at home. Remove distracting objects. Curtail intake of junk food. Eat healthy and stay fit. Drink water at regular intervals. Take hourly breaks for a stroll. Maintain a positive frame of mind. Do not overstress yourself. Relax periodically. Wake up early for a brisk morning exercise followed by a good balanced meal; and revise your learning from the previous day to gear up for the day’s class. Revise your learning of the day at night before going to bed. On Sundays, revise the entire week’s class work. The steps suggested below will help you maximize your output. Skim the chapter, noting the topic words in the bold print, the tables, diagrams, mind maps and summary charts. The second step is to learn intelligently, with insight. Focus on understanding the meaning and definition of the key words and their relationship with the whole concept or with other keywords. An ideal way to do this step is to make mind maps, concept maps and revise them periodically. Read in detail, studying each area thoroughly, and do not proceed to the next until you understand a concept well. Read aloud, explaining to yourself what you read and make up your own examples for a better understanding of the concepts. Re-reading the material aloud especially in your own words helps clarify the information and reinforces your learning. This step pertains to learning by rote. The focus in this step is on memorizing the names, terms, key concepts, definitions, facts, figures or formulas in the chapter/lesson. Make notes of these for a ready reference at later stages of periodic revision. 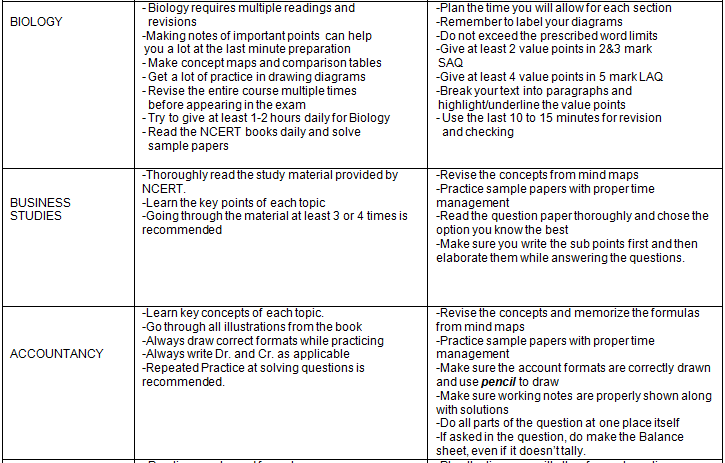 Revise the prepared notes, concept maps periodically. 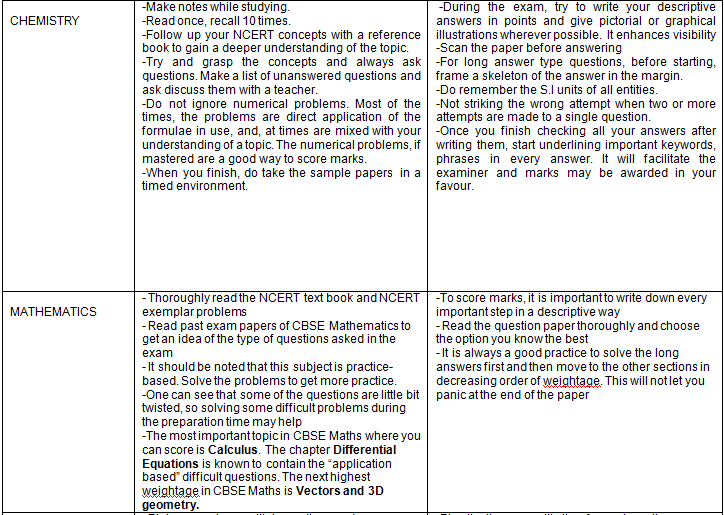 Practice by solving past exams papers and sample papers in allowed time span. CBSE has made certain changes in the question pattern in its latest Sample papers for the 2019 Board Exams. Verify the exact location of your examination centre at least one day before the exam. When you are sure of the location, find out the buses or trains that take you there. If you are using your own vehicle make sure, it is in condition. Check the exact time of the commencement of your examination. Plan to be there at least half an hour before the scheduled time. If commuting is going to take you half an hour, you shall start at least an hour before the exam starts. Anxiety and excitement are normal on the eve of the examination. Overcome excessive worry. Say to yourself, “Tomorrow is the day I have been preparing for all these months. Now is my chance to prove myself.”And, feel confident. To minimize exam anxiety, avoid talking about your preparation and state of mind to others. Have a light meal and listen to some soft music to relax. Review only your keywords with the emphasis on practising recall. Attempting to cram once more is tempting but you will end up dissipating your energy and it will be a self defeating exercise. Go to bed relaxed with a sense of relief that the strain of preparing for the exam is soon to get over. Tell yourself, all is going to turn out well. At this point, an hour of sleep is more valuable to your performance than an hour of extra cramming. In fact, it is advised to go to bed a little earlier than usual. Sleep at least 8 hours on the exam eve. Sufficient sleep assists digestion and repairs and regenerates the brain cells. So, you will wake up feeling good, and it will infuse confidence and calm in you before the exam. At last, when the day of reckoning is here, how do you feel? Use positive visualization and self talk. Imagine yourself doing well, recalling easily and calmly dealing with uncertainty and difficult questions. Employ your anxiety relieving strategies. Use deep breathing and other relaxation techniques when you feel the need for them. Generally, avoid talking to other nervous students. It only feeds your anxiety and inhibits your concentration. Once you are inside the room, check up and take the seat assigned to you. In a situation like finding your seat uncomfortable, seek the invigilator’s help and get it changed. Avoid sitting near someone who may turn out to be disturbing in the due course of time. Choose a quiet area. Complete the identification details , regarding your name, registration number, correct name/code of your course, name/code of your exam centre and date. 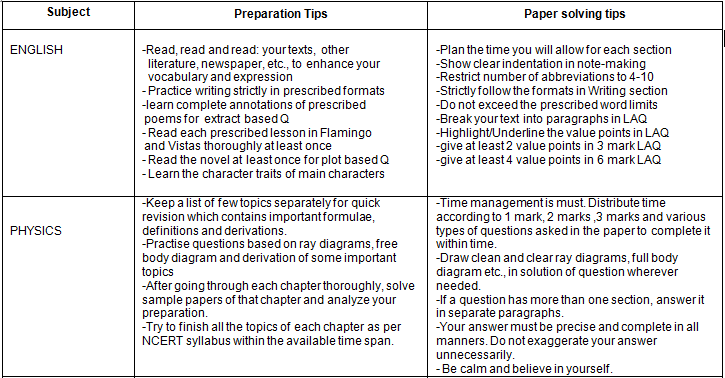 As soon as you receive the question paper, read and re-read the directions carefully. One of the biggest causes of errors in exam is simply failure to read the instructions. Even if you find the paper tough, don’t panic. Keep on trying, and eventually, you will find answers to some of the questions. Remember, if the paper is tough, it is tough for everybody and the effect would be same on all the students taking the exam. Stay put for the entire exam time. Even if you think you have done all that you can, stay to the end. Relax and let your mind wander. This relaxed state of mind will surprise you with the answer of the question you were stuck at earlier. Keep 10 minutes aside to give yourself a chance to revise. While revising, make changes/corrections you are certain of. Ignore what others are doing, what question they are working on and when they are leaving. Focus on your own work and your own pacing. Read each question very carefully. Budget your time wisely. Assign time to each question or section according to how much it counts. Stick to strict allocation initially and return to unfinished items if you have time left. Aim to complete your paper in 2 hours 45 minutes so that you have 15 minutes to revise your answers. Have a look at the Subject – wise expert tips for maximum output suggested by our experts in the various subjects.